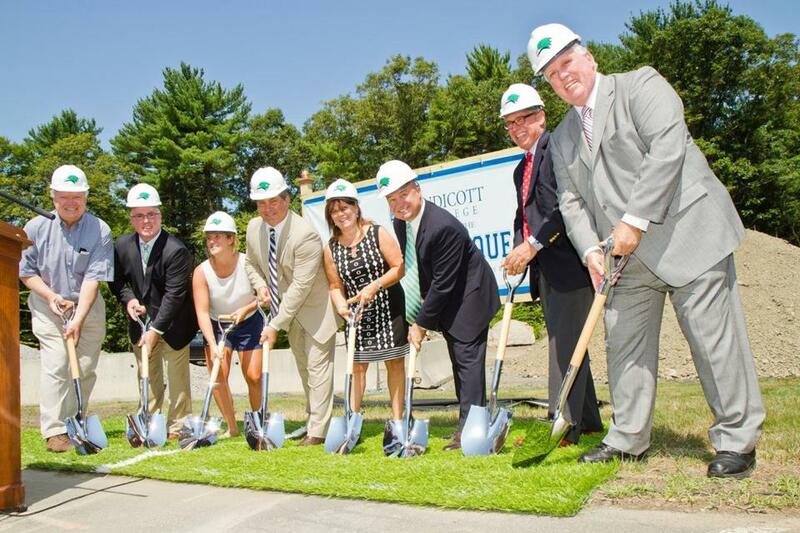 Taking part in Tuesday’s groundbreaking were (from left) Endicott board president Tom Alexander; athletic director Brian Wylie; hockey alumna Addie Weeks; rink namesake Raymond J. Bourque and his wife, Christiana; former Boston Bruin Cleon Daskalakis; Lee Dellicker, Windover Construction; and the college’s president, Richard Wylie. The North Shore hockey community has strong but dated ties to the Boston Bruins. When the National Hockey League team’s practice facility was at the old Town Line Twin Rinks on Route 114 in Danvers, back in the 1980s, many players made their homes close by. The Town Line facility is long gone, however, and the Bruins moved their practices to Ristuccia Arena in Wilmington in 1987. As a result, many players opted to live elsewhere, except for a select few. That small group included goalie Tim Thomas, before his self-imposed sabbatical, and more famously, Hall of Fame defenseman Ray Bourque. The longtime Topsfield resident’s imprint on the North Shore is being cast in stone — the new $8.5 million rink at Beverly’s Endicott College will officially be named the Raymond J. Bourque Ice Arena. With the official groundbreaking last week, construction is underway, and the rink is expected to open next summer, coinciding with the Endicott men’s and women’s club hockey teams graduating to NCAA Division 3 varsity status. “We’ve been talking about it for so long, and it really strengthens the opportunity for young men and women to play college hockey at a high level, and add to the spirit and pride we already have on our campus,” said Brian Wylie, Endicott’s athletic director and former coach of the men’s club hockey team . The rink’s ripple effect, however, will be felt off campus too. It’s not an exaggeration to say that Bourque, who finished his NHL regular season career with 410 goals and 1,169 assists, lent a huge assist to the youth and high school hockey programs in town. The new rink is expected to have a significant impact in an area that has lost six ice rinks since 1986 — the twin sheets in Danvers, two in Beverly (just up the road from the high school), one in Essex, and one at Gordon College in Wenham. Only one new rink, at the Pingree School in Hamilton, has been built during that time. “I can’t put it in words. That’s how important it is,” said Todd Lampert , a longtime member of the Beverly Youth Hockey board and owner of Todd’s Sporting Goods. Discussions with Endicott officials started as early as 1994, and picked up momentum after the establishment of the men’s club hockey team in 2001 and the women’s club team in 2007. Wylie said Endicott is committed to Beverly’s school and youth programs, but it will consider additional North Shore youth programs once college officials get a better handle on the rink’s schedule. Lampert said having consistent, predictable, and favorable ice time in Beverly will be an enormous benefit to youth and high school hockey families that have had to travel at all hours of the day to skate. “You can’t imagine what that’s going to do for not only the kids who are already in the program and their parents, but it’s also going to be able to attract new kids,” he said. For Bob Gilligan, the recently retired varsity boys’ coach at Beverly High, Bourque’s association with the Endicott rink is an extension of the good will that the Bruins organization is known for. When Gilligan was battling cancer in the fall of 2012, Bruins assistant coach Doug Houda made the trek north to help run practices. “If you ask any Bruins player what rink made the greatest impression, it’s probably when they were kids growing up and their own home rink,” said Gilligan, whose Panthers won the state Division 2 championship last spring. “The kids growing up today are going to remember Endicott the same way. Especially with Ray stepping in and the Bruins organization helping out, it’s a win, win, win situation. Andrew McPhee , the recently hired head coach of Endicott’s fledging varsity women’s squad, said the Bourque Arena will not only bolster recruiting efforts, but the school’s ties to the city. “It’s going to benefit us as a way to attract hockey players to Endicott,” said McPhee. “And in the long run, it’s going to enable the players to give back through learn-to-skate programs, or community service. So the young girls just starting out can have role models that they can identify with right off the bat. Brion O’Connor can be reached at brionoc@verizon.net.